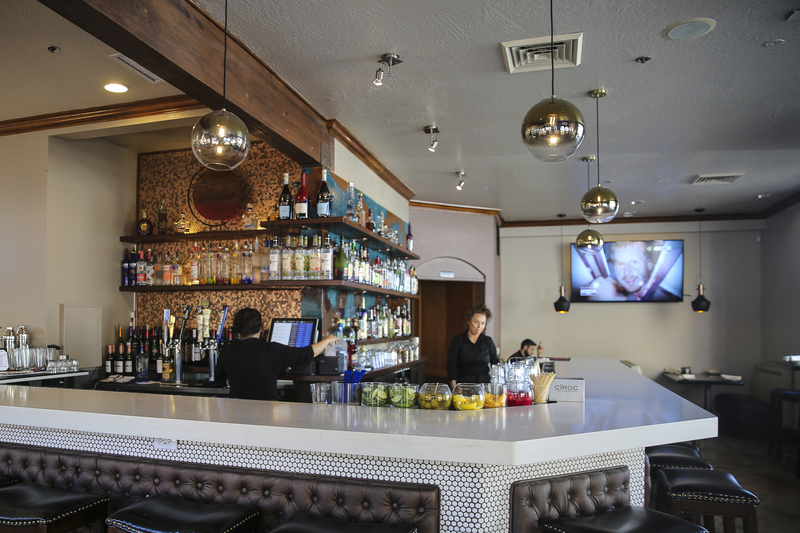 Whether you’re eating, drinking, and/or socializing, lately, Skewers Restaurant is the hottest place to “Be” and to “Be seen”! If you are a native of Modesto, then you are fully aware that Skewers Restaurant is not new; only the location is. They recently relocated from 9th and J to 821 L Street, and with the move, a new hotspot began. 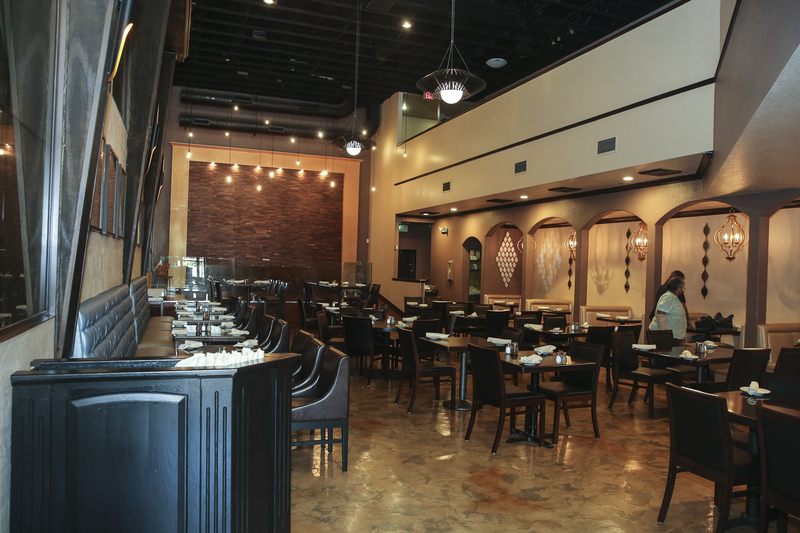 Father-Son duo, Brad Morad and Yonatan Moradkhan knew exactly what they were doing when they opened Skewers Restaurant, specializing in Mediterranean cuisine, back in 2003. Six months later, they hired manager, Kristen O’Brien and this year, she became a partner alongside Brad and his father. Together, the three of them, are a force to be reckoned with! The atmosphere creates a sense of excitement and calm – All at the same time! Typically, the words “excitement” and “calm” do not naturally align themselves. However, something about Skewers makes you feel both of those energies simultaneously. The ambiance provides a bit of a Los Angeles vibe. 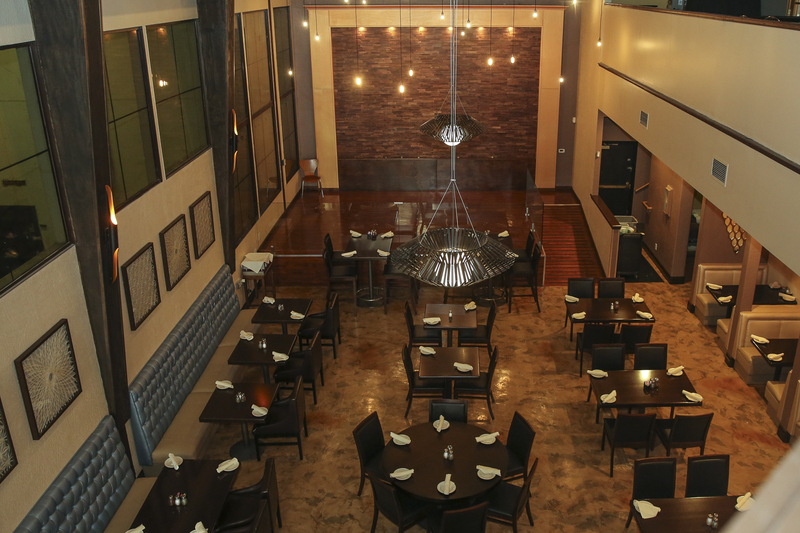 In fact, in addition to the intimate lighting and beautiful decorum, there is a section of the restaurant that leads out to a beautiful open patio. Now, let’s talk food! As always, I brought famed Modesto View Magazine photographer, Michael “MJ” Mangano along. We had an appetizer first, but this was no regular appetizer my friends! 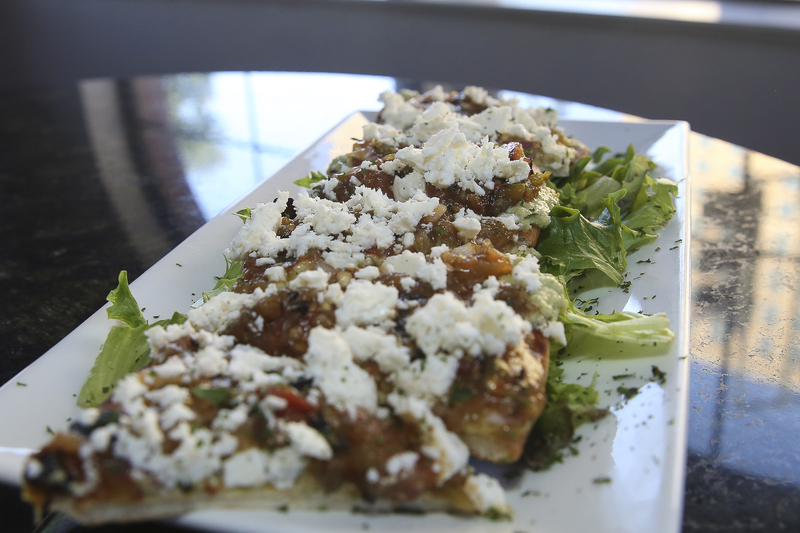 In my entire life, hands down, I have never tasted a bruschetta so incredible! 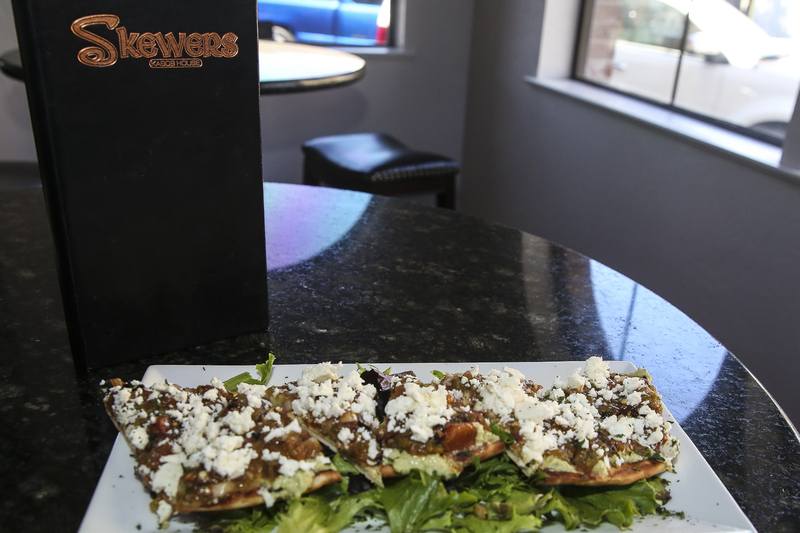 They take toasted pita bread and cover it with hummus, fresh cilantro, jalapeño, and roasted vegetables. Then, they top it off with feta cheese. It is exquisite! As I nibbled, I sat in my seat, sinking into an imaginary, edible paradise. As if the bruschetta weren’t enough, next, a sample of dolma arrived at the table. Just as everything else is homemade in Skewers, the dolma is no different, and they roll it themselves. 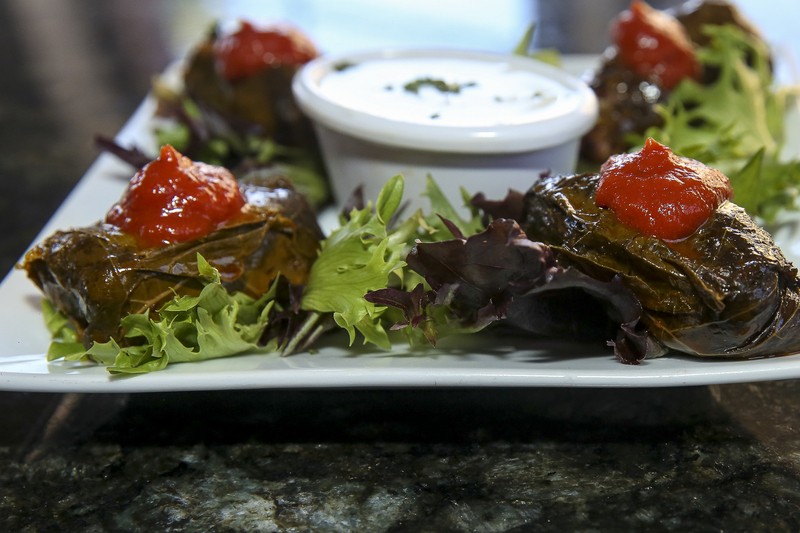 Dolma, (in case you’re not familiar), is a stuffed grape leaf, made with herbs and spices, then filled with ground beef. 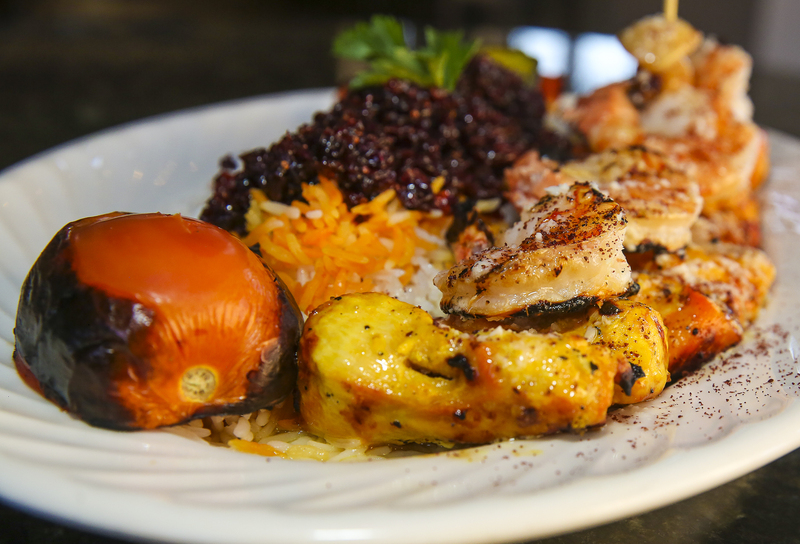 A large variety of skewered Mediterranean meals and shish kabobs are cooked over an open flame at Skewers. 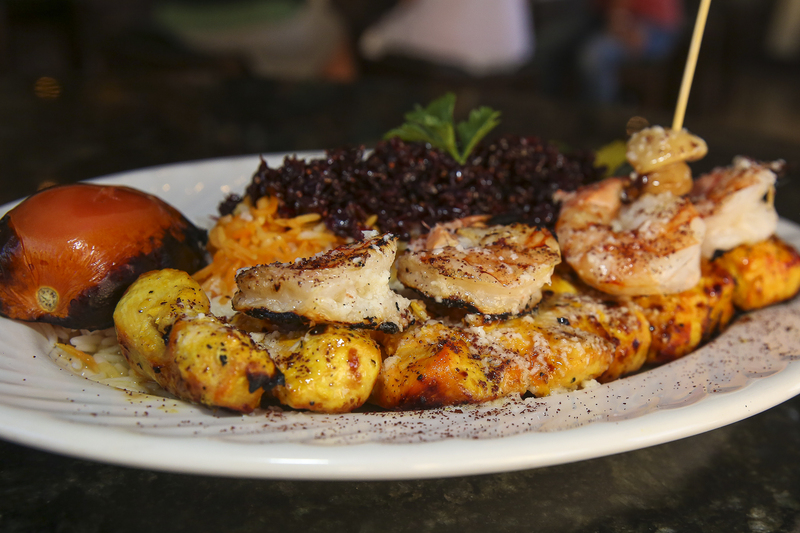 A shish kabob favorite is the Lula Kabob. This is a traditional Persian kabob is made with Angus Sirloin. Unsure about what to try? Inquire about the Skew Sampler. For your mouth-watering pleasure, it consists of three different types of skewers. The sampler includes teriyaki beef, saffron chicken breast, and tiger prawns, covered in homemade lemon butter garlic sauce. Most of the dishes are served with long grain, basmati rice. The rice is fluffy and light and ours had the added attraction of red barberries. The red barberries presented such a brightness to the plate, that I almost mistook them for ruby-red sapphires. 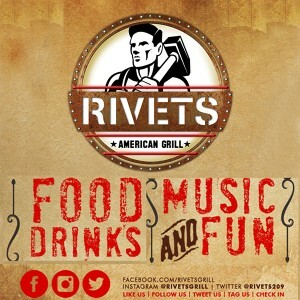 Happy Hour is Monday through Friday from 4:00 PM -7:00 PM. You can have drinks, feast on $3 appetizers, or try some homemade yogurt. Do not leave Skewers without having dessert! 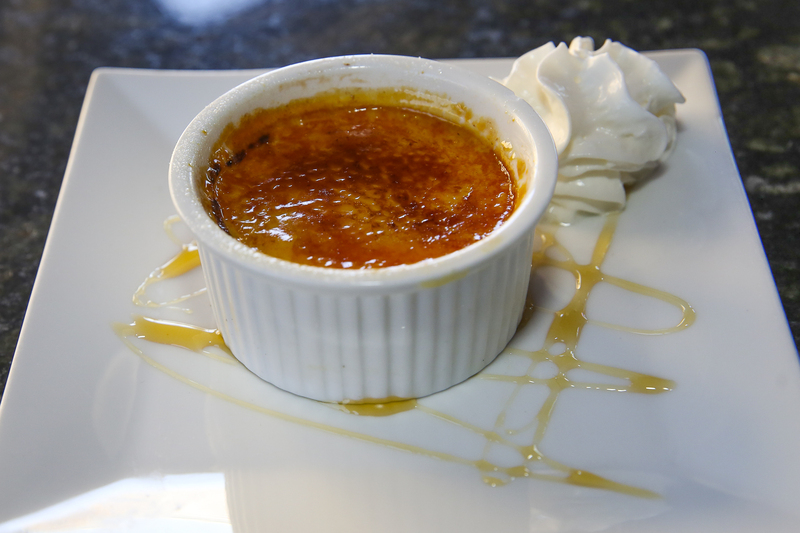 Ask about the crème brûlée, baklava, or simply cool off with a refreshing bowl of Pomegranate Ice Cream with dark chocolate chips. Brad, Yonatan, and Kristen are happily serving Modesto with humility, hospitality, grace, and most importantly: Delicious food! 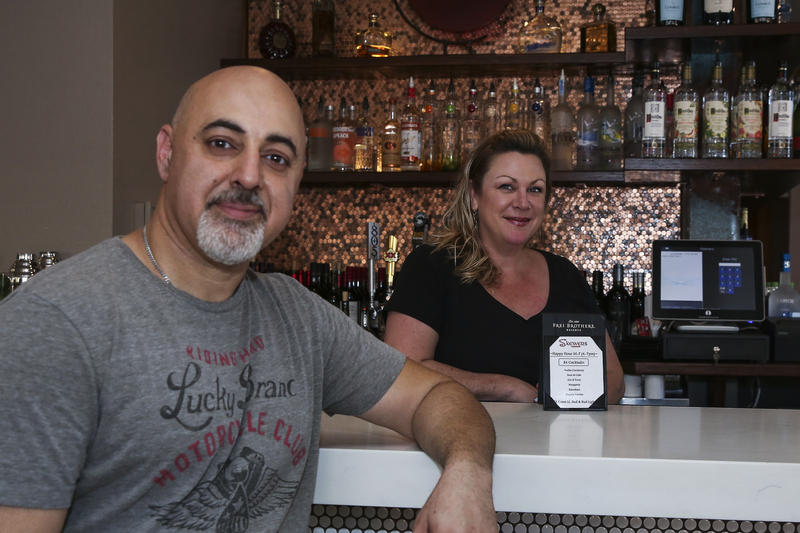 I asked, “What do you think is the real secret as to why Skewers has lasted so long?” Without a beat, and in a sincerely heartfelt way, Kristen replied, “Well, Modesto is a very special place, and we are completely honored being a part of it. Our involvement with community events, including donations, are how we try to give back. We really care about our city and we hope it shows.” It does! As always: Let’s love our Modesto! Let’s embrace our Modesto! Let’s continue to spread our smiles in Modesto. C’mon Positive Peeps – IT’S WHERE WE LIVE!